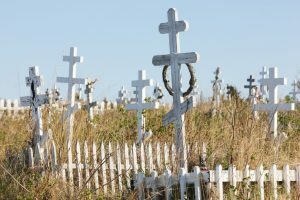 Slot machines, card games, and a cemetery. In the middle of the parking lot. Odd? Yes, but also reality for the new del Lago Resort and Casino in New York, which had to build its parking around a generations-old cemetery the state said it couldn’t relocate. Now surrounded by a fence and covered in snow, the old headstones were preserved in the parking lot for surviving family members to continue to visit. Local residents say people who used to farm that land are buried there. Check out the whole story and photos here.